Studio Ghibli is a long-standing user of Toonz, chosen by the famed Japanese studio for its line quality. Hand-drawn artwork usually has an emotive quality that may be lost when it is passed on a computer and this is a concern for studios, like Studio Ghibli, that want to produce cartoon taking advantages of a computer-assisted production without compromising the quality of their work. Note: The external links below are to a fan Web site in English, not to the official Studio Ghibli Web site. Toonz has the ability to preserve all the nuances of the original drawings made on paper and this is one of the main reasons why director Hayao Miyazaki and Studio Ghibli started to use Toonz since the realization of the movie Princess Mononoke. Then they continued to use it for inking & painting and composing the masterpiece Spirited Away, Golden Bear Award winner at the Berlin International Film Festival of 2002 and Academy Award® winner as best animated feature film of 2003. Four years in the making, Spirited Away, with 15,8 millions $ only in the first weekend, has far surpassed previous successes like Princess Mononoke and My Neighbour, Totoro, which are two of the most well-known Studio Ghibli productions outside Japan. Spirited Away has the same trademark two-dimensional hand-drawn animations that have characterized every Miyazaki film ever made. 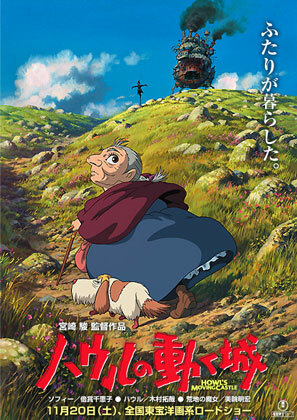 But what is different this time is that Miyazaki has chosen to go back to a Japan long forgotten by modern society. Chihiro, a 10-year-old girl in the midst of a move to the suburbs with her parents, wanders into a mysterious town. It's the "other world" of gods and monsters, ruled over by a witch, where humans are changed into animals and disappear. 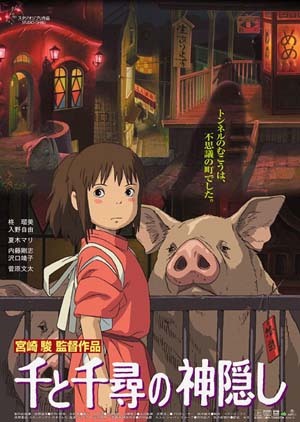 Chihiro's parents are turned into pigs for eating the food of the gods without permission and it is up to Chihiro to save them and find a way out of this land of the dead. With the help of a boy, Haku, Chihiro finds that she has to rely on herself to survive. The storyline may seem to be targeted only at children, but this is much more than just a cartoon for the kids, infact Miyazaki's films are also social commentaries on the times. In 2004 director Miyazaki and Studio Ghibli won at the Venice Film Festival the Osella award for the best technical achievement with the movie Howl’s Moving Castle (Howl no ugoku shirou). The latest motion picture Ponyo on the Cliff (Gake no ue no Ponyo), produced by Studio Ghibli, was presented at the Venice Film Festival 2008. Founded in 1984 by Hayao Miyazaki and Isao Takahata, Studio Ghibli has become one of the foremost producers of feature-length animated films in the world. Ghibli, an Italian word for a strong Sahara wind, describes the overwhelming effect this small but potent studio has had on Japanese culture. Its films have consistently been cited by Japanese critics, and are frequently the most popular films in their year of release in Japan.